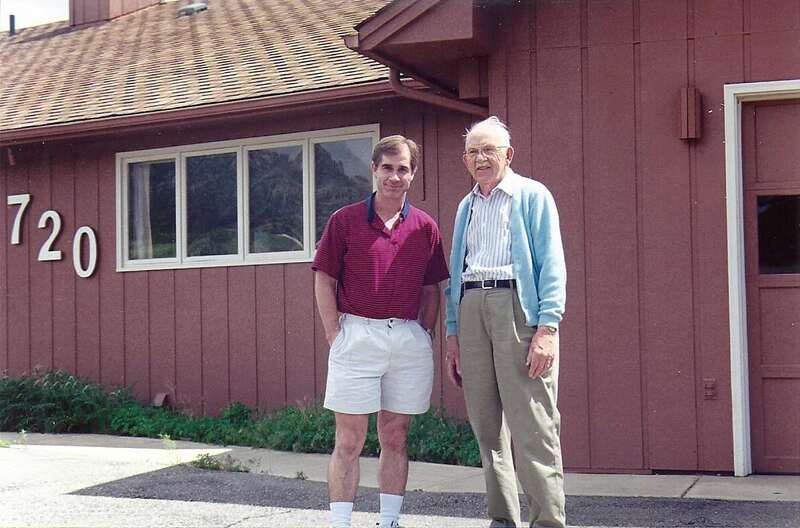 On the final morning of the 1998 Spring Meeting held in Boulder, Colorado, there was a choice of field trips. One to see the Mt. Evans Observatory and the other to see the home of Edward A. Halbach. Mt. Evans would have to wait. There was no way I could pass up the opportunity to meet a man I considered a living legend. Ed Halbach's amateur astronomical resume is second to none. 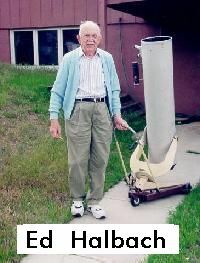 He was a founding member of the Milwaukee Astronomical Society (MAS) in 1932, served as its president for a number of years, and was the MAS Observatory Director from 1942 to 1977 when he retired to Colorado. He also helped in forming the Astronomical League and became its first President in 1947. He was involved in numerous endeavors that allow amateurs to make useful scientific contributions. Read more about Ed Halbach here. 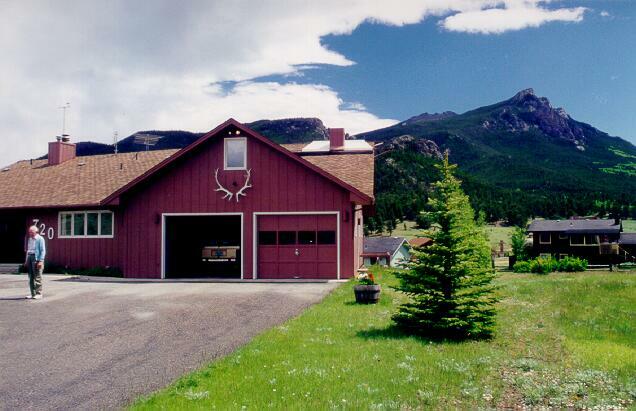 Ed's home in Colorado is near Estes Park and in the middle of the Rocky Mountains. 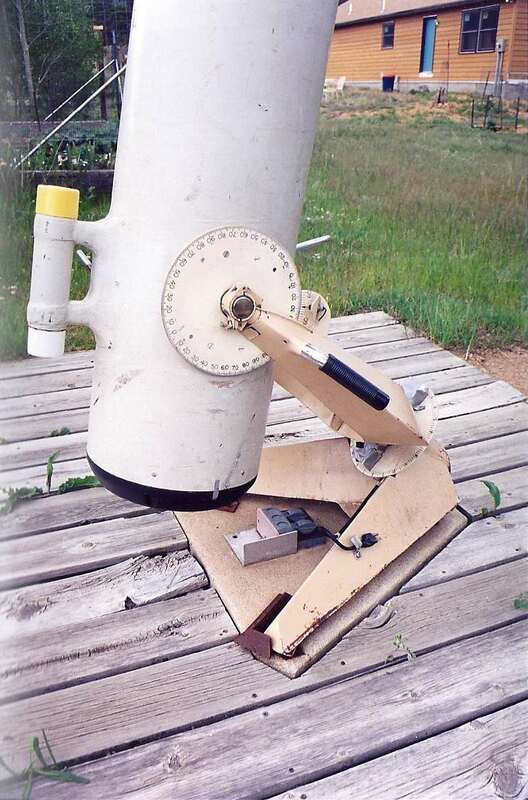 Ed built an observatory that houses a 14.25" scope in the roof of his home, but it seems he prefers to observe with a 10 inch f/5.6 "portascope" that he designed and helped build when he was the MAS Observatory Director. Even though it was broad daylight, Ed rolled everything out for me to see, just as if we really going to do a session of variable stars. 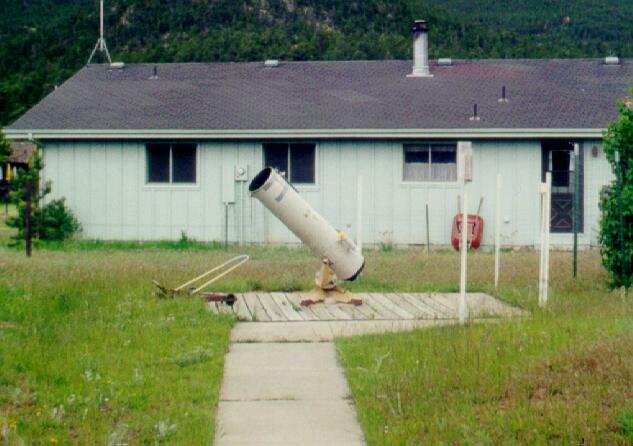 The scope and observing cart are kept in the back of the house. Ed built a "V" shaped dolly to roll the scope out the back door (there's a small ramp to get over the lip) and down the sidewalk to the observing platform. The base of the mount then clamps securely to the platform for instantaneous polar alignment. The original mount was designed for Milwaukee's latitude. Therefore, he jacks up the back in order to compensate for his slightly lower latitude in Colorado. This MAS "portascope" has been modified in a number of ways. It has a finder scope, it has large setting circles, and a clock drive. 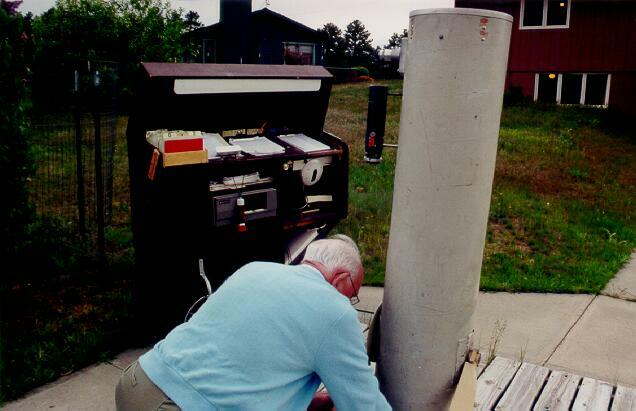 Ed has always relied on setting circles to locate his variable fields. 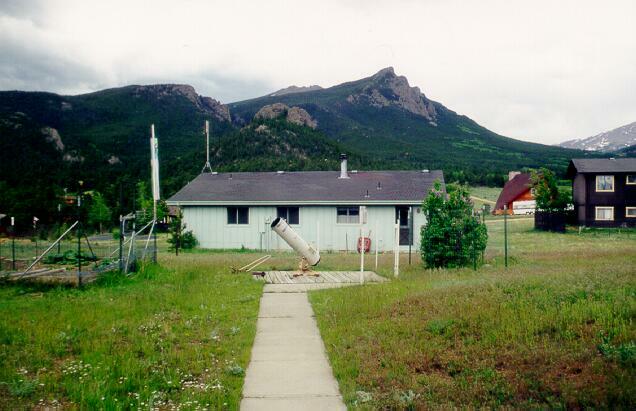 If you don't have a permanent observatory, what are you going to do about consulting variable star charts, observing lists, and recording your observations? Ed's solution was an observer's cart! He rolls this out right next to the scope and plugs it in. 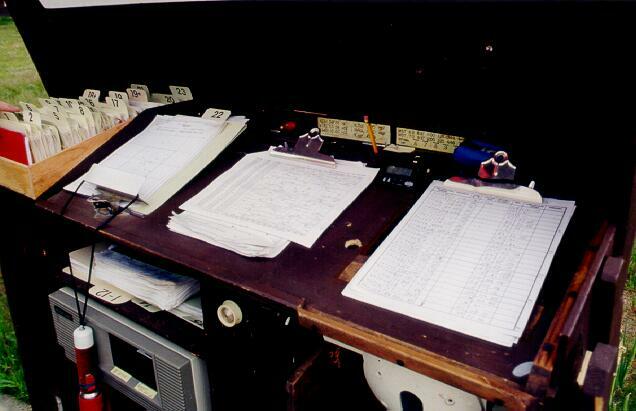 It contains all his charts, observing schedule, and a computer. When I visited Ed he was already 89 years old. It is my hope that I'm still participating in observational astronomy when I'm that age! I wished him many more years, and he did. 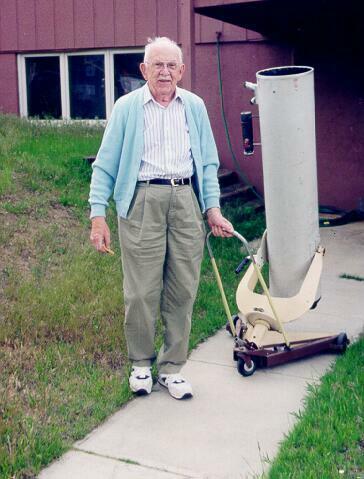 He was observing until he passed away in 2011 at age 101, amassing over 100,000 variable star estimates! * I originally wrote this article shortly after my visit in 1998 so I've since updated a few details and there are a couple of important footnotes. One part of my visit that was very memorable was seeing Ed's Peltier Award plague on the wall of his office. This award is given to amateurs (and some professionals that have made careers coordinating with amateurs) who have made significant contributions to science. Ed was the first winner of this award (after Leslie Peltier himself, posthumous) in 1981. Never in my wildest imagination did I think that one day I myself would be awarded this prize. And as fate would have it, I returned to Milwaukee and have been able to become active again in the MAS. 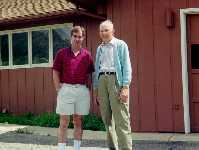 I now hold the position of Observatory Director, the same one that Ed held for an amazing 35 years.